Finest creations of Gujarat are not only the efforts of Indian monarchs also there is a little bit contribution of the citizenry as well. Pols are distinct residential areas that are unique only to Gujarat. "Pol" is derived from Sanskrit word "Poli." Typically, a pol has one entrance and homogenous groups of people live in it. Rectangular or square in shape, Pols are residences aligned compactly in a row and have several floors. Earlier pols were preferred as the residential accommodation by the people of Gujarat because of the feeling of protection it offered and identity they provoked. One can find the specimen of pols in Ahmedabad, Nadiad, Vadodara, Patna and Khambat. 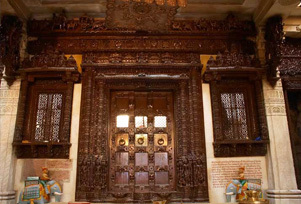 There are nearly 360 pols in Gujarat, each depicting finest lovely wooden windows, brackets, magical balconies, chabutras, khasdkis and chowks. Time has bestowed beauty to pol architecture of Gujarat, making them an ornament of world architecture.